The Tokugawa shogunate, also known as the and the , was a feudal regime of Japan established by Tokugawa Ieyasu and ruled by the shoguns of the Tokugawa family. This period is known as the Edo period and gets its name from the capital city, Edo, which now is called Tokyo . The Tokugawa shogunate ruled from Edo Castle from 1603 until 1868, when it was abolished during the Meiji Restoration. Following the Sengoku Period of "warring states", central government had been largely re-established by Oda Nobunaga and Toyotomi Hideyoshi during the Azuchi-Momoyama period. After the Battle of Sekigahara in 1600, central authority fell to Tokugawa Ieyasu who completed this process and received the title of shogun in 1603. In order to become shogun, one traditionally was a descendant of the ancient Minamoto clan. 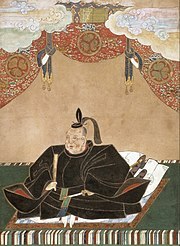 The Tokugawa period, unlike the shogunates before it, was supposedly based on the strict class hierarchy originally established by Toyotomi Hideyoshi. The warrior-caste of samurai were at the top, followed by farmers, artisans, and traders. The inflexible nature of the Social stratification system unleashed disruptive forces over time. Taxes on the peasantry were set at fixed amounts which did not account for inflation or other changes in monetary value. As a result, the tax revenues collected by the samurai landowners were worth less and less over time. This often led to numerous confrontations between noble but impoverished samurai and well-to-do peasants, ranging from simple local disturbances to much bigger rebellions. None, however, proved compelling enough to seriously challenge the established order until the arrival of foreign powers. Toward the end of the 19th century, an alliance of several of the more powerful daimyo with the titular Emperor finally succeeded in the overthrow of the shogunate after the Boshin War, culminating in the Meiji Restoration. The Tokugawa Shogunate came to an official end in 1868, with the resignation of the 15th Tokugawa Shogun, Tokugawa Yoshinobu and the "restoration" (Ōsei fukko) of imperial rule. See Late Tokugawa shogunate for details. The bakuhan taisei ( ) was the feudal political system in the Edo period of Japan . Baku, or "tent," is an abbreviation of bakufu, meaning "military government" — that is, the shogunate. The han were the domains headed by daimyo. The shogunate had the power to discard, annex and transform domains. The sankin kōtai system of alternative residence required each daimyo would reside in alternate years between the han and attendance in Edo. In their absence from Edo it was also required that they leave family as hostages until their return. The huge expenditure sankin-kotai imposed on each han helped centralize aristocratic alliances and ensured loyalty to the Shogun as each representative doubled as a potential hostage. Tokugawa's descendants further ensured loyalty by maintaining a dogmatic insistence on loyalty to the Shogun. Fudai daimyo were hereditary vassals of Ieyasu, as well as of his descendants. Tozama, or "outsiders", became vassals of Ieyasu after the battle of Sekigahara. Shinpan, or "relatives", were collaterals of Tokugawa Hidetada. Early in the Edo period, the shogunate viewed the tozama as the least likely to be loyal; over time, strategic marriages and the entrenchment of the system made the tozama less likely to rebel. In the end, it was the great tozama of Satsuma, Chōshū and Tosa and to a lesser extent Hizen that brought down the shogunate. These four states are called the Four Western Clans or Satchotohi for short. Despite the establishment of the shogunate, the emperor in Kyoto was still the legitimate ruler of Japan. The of Japan was a task given by the Imperial Court in Kyoto to the Tokugawa family, which they returned to the court in the Meiji Restoration. The shogunate appointed a liaison, the Kyoto Shoshidai (Shogun's Representative in Kyoto), to deal with the emperor, court and nobility. Foreign affairs and trade were monopolized by the shogunate, yielding a huge profit. Foreign trade was also permitted to the Satsuma and the Tsushima domain. From 1600 onward, Japan started to participate actively in foreign trade. In 1615, an embassy and trade mission under Hasekura Tsunenaga was sent across the Pacific to Nueva Espana (New Spain) on the Japanese-built galleon San Juan Bautista . Until 1635, the Shogun issued numerous permits for the so-called "red seal ships" destined for the Asian trade. After 1635 and the introduction of Seclusion laws, only inbound ships were allowed, from China , Korea , and the Netherlands . The rōjū ( ) were the senior members of the shogunate. They supervised the ōmetsuke, machibugyō, ongokubugyō and other officials, oversaw relations with the Imperial Court in Kyoto, kuge (members of the nobility), daimyo, Buddhist temples and Shinto shrines, and attended to matters like divisions of fiefs. Normally, four or five men held the office, and one was on duty for a month at a time on a rotating basis. They conferred on especially important matters. In the administrative reforms of 1867, the office was eliminated in favor of a bureaucratic system with ministers for the interior, finance, foreign relations, army, and navy. In principle, the requirements for appointment to the office of rōjū were to be a fudai (hereditary) daimyo and to have a fief assessed at 50 000 koku or more. However, there were exceptions to both criteria. Many appointees came from the offices close to the shogun, such as soba yōnin, Kyoto shoshidai, and Osaka jōdai. Irregularly, the shoguns appointed a rōjū to the position of tairō (great elder). The office was limited to members of the Ii, Sakai, Doi, and Hotta clans, but Yanagisawa Yoshiyasu was given the status of tairō as well. Among the most famous was Ii Naosuke, who was assassinated in 1860 outside the Sakuradamon Gate of Edo Castle . The wakadoshiyori were next in status below the rōjū. An outgrowth of the early six-man rokuninshū (1633–1649), the office took its name and final form in 1662, but with four members. Their primary responsibility was management of the affairs of the hatamoto and gokenin, the direct vassals of the shogun. Some shoguns appointed a soba yōnin. This person acted as a liaison between the shogun and the rōjū. The soba yōnin increased in importance during the time of the fifth shogun Tokugawa Tsunayoshi, when a wakadoshiyori, Inaba Masayasu, assassinated Hotta Masatoshi, the tairō. Fearing for his personal safety, Tsunayoshi moved the rōjū to a more distant part of the castle. Some of the most famous soba yōnin were Yanagisawa Yoshiyasu and Tanuma Okitsugu. The ōmetsuke and metsuke were officials who reported to the rōjū and wakadoshiyori. The five ōmetsuke were in charge of monitoring the affairs of the daimyo, kuge and imperial court. They were in charge of discovering any threat of rebellion. Early in the Edo period, daimyo such as Yagyū Munefuyu held the office. Soon, however, it fell to hatamoto with rankings of 5000 koku or more. To give them authority in their dealings with daimyo, they were often ranked at 10 000 koku and given the title of kami (an ancient title, typically signifying the governor of a province) such as Bizen-no-kami. As time progressed, the function of the ōmetsuke evolved into one of passing orders from the shogunate to the daimyo, and of administering to ceremonies within Edo Castle. They also took on additional responsibilities such as supervising religious affairs and controlling firearms. The metsuke, reporting to the wakadoshiyori, oversaw the affairs of the vassals of the shogun. They were the police force for the thousands of hatamoto and gokenin who were concentrated in Edo. Individual han had their own metsuke who similarly policed their samurai. The san-bugyō ("three administrators") were the jisha, kanjō, and machi-bugyō, which oversaw temples and shrines, accounting, and the cities, respectively. The jisha bugyō had the highest status of the three. They oversaw the administration of Buddhist temples (ji) and Shinto shrines (sha), many of which held fiefs. Also, they heard lawsuits from several land holdings outside the eight Kantō provinces. The appointments normally went to daimyo; Ōoka Tadasuke was an exception, though he later became a daimyo. The kanjō bugyō were next in status. The four holders of this office reported to the rōjū. They were responsible for the finances of the shogunate. The machi bugyō were the chief city administrators of Edo and other cities. Their roles included mayor, chief of the police (and, later, also of the fire department), and judge in criminal and civil matters not involving samurai. Two (briefly, three) men, normally hatamoto, held the office, and alternated by month. Three Edo machi bugyō have become famous through jidaigeki (period films): Ōoka Tadasuke and Tōyama Kinshirō as heroes, and Torii Yōzō as a villain. The san-bugyō together sat on a council called the hyōjōsho. In this capacity, they were responsible for administering the tenryō, supervising the gundai, the daikan and the kura bugyō, as well as hearing cases involving samurai. The shogun directly held lands in various parts of Japan. These were known as bakufu chokkatsuchi; since the Meiji period, the term tenryō has become synonymous. In addition to the territory that Ieyasu held prior to the Battle of Sekigahara, this included lands he gained in that battle and lands gained as a result of the Summer and Winter Sieges of Osaka. By the end of the seventeenth century, the shogun's landholdings had reached four million koku. Such major cities as Nagasaki and Osaka, and mine, including the Sado gold mine, also fell into this category. Rather than appointing a daimyo to head the holdings, the shogunate placed administrators in charge. The titles of these administrators included gundai, daikan, and ongoku bugyō. This last category included the Osaka, Kyoto and Sumpu machibugyō, and the Nagasaki bugyō. The appointees were hatamoto. The Late Tokugawa Shogunate ( Bakumatsu) is the period between 1853 and 1867 during which Japan ended its isolationist foreign policy called sakoku and modernized from a feudal shogunate to the Meiji government. It is at the end of the Edo period and preceded the Meiji era. The major ideological/political factions during this period were divided into the pro-imperialist Ishin Shishi (nationalist patriots) and the shogunate forces, including the elite shinsengumi (newly selected corps) swordsmen. Although these two groups were the most visible powers, many other factions attempted to use the chaos of Bakumatsu to seize personal power. Furthermore there were two other main driving forces for dissent; first, growing resentment of tozama daimyo (or outside lords), and second, growing anti-western sentiment following the arrival of Perry. The first related to those lords who had fought against Tokugawa forces at Sekigahara (in 1600 AD) and had from that point on been exiled permanently from all powerful positions within the shogunate. The second was to be expressed in the phrase sonnō jōi, or "revere the Emperor, expel the barbarians". The turning point of the Bakumatsu was during the Boshin War and the Battle of Toba-Fushimi when pro-shogunate forces were defeated. Bolitho, Harold. Treasures among men; the fudai daimyo in Tokugawa Japan. New Haven: Yale University Press, 1974.